ParentingClub.com is pleased to offer the latest 2 DVD releases from Sesame Street! They are called TV Episode Fun Pack Vol. 1 & Vol. 2. We are giving you the chance to win both releases!! 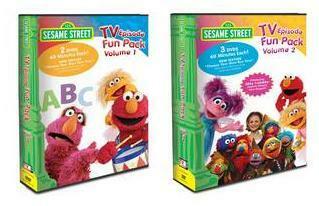 Grab these Fun Packs for hours of laughter and fun, featuring some of the most popular recent episodes of Sesame Street. Get more info about these fun packs here and here. Limited to one (1) entry per person, per household, per day . See official rules. I am sorry, this sweepstakes has now closed. Please check back often for future Parenting Club contests and sweepstakes!